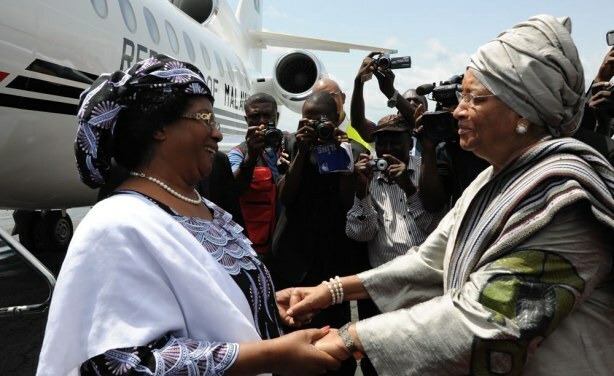 A few weeks after she was sworn in as Malawi’s first female president, Joyce Banda (Photo: Left – with Sirleaf) travelled to Liberia in late April 2012 to meet President Ellen Johnson Sirleaf, who has occupied Liberia’s highest office since January 2006. Glowing in African attire, both leaders bantered like sisters during a press conference. To be sure, before Ms. Banda became president, photos of African leaders at African Union summits, for example, depicted a group of men surrounding Ms. Sirleaf, who had been the only female president in Africa then. Gender equality advocates had further reason to celebrate, when Catherine Samba-Panza was sworn in on 23 January 2014 as interim president of the Central African Republic (CAR), making her the fourth African female head of state. The first was Ruth Perry, who headed the Liberian transitional government for about a year from September 1996. Regrettably, Ms. Banda, the second woman to be seated as president, became the first to be unseated when she lost the elections, in what some say was a retaking of power by loyalists of the late President Bingu wa Mutharika. Besides the four female heads of state, Ms. Tripp bases her upbeat assessment on the increasing number of women parliamentarians on the continent. Indeed, with 64% of seats held by women, Rwanda has the highest number of women parliamentarians in the world. Senegal, Seychelles and South Africa have more than 40% each, and Mozambique, Angola, Tanzania and Uganda are not far off, with women occupying over 35% of all parliamentary seats. Considering that women hold only 19% of the seats in the US congress and 20% in the senate, Ms. Tripp maintains that Africa has every right to be proud. While 74% of respondents in East Africa believe in women’s equality and 73% in Southern Africa, only 50% in North Africa agree that women should have the same rights as men. In fact, women’s leadership was rejected by 53% of respondents in Sudan and by 50% in Egypt. 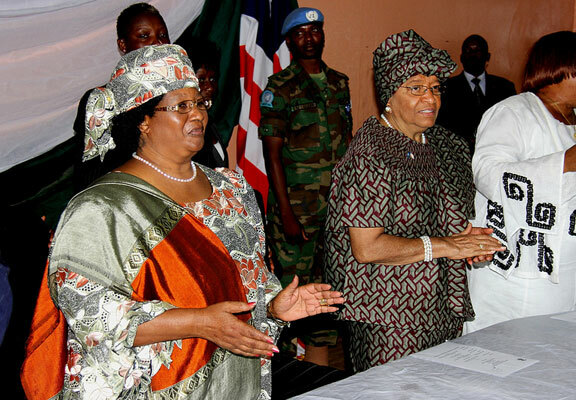 Sirleaf was elected after a 13-year devastating civil war; Ms. Banda, who had been vice president, took over after President Bingu wa Mutharika died in office; and Ms. Samba-Panza was sworn in amid rebellion and sectarian violence in the CAR and Ms. Perry headed the interim government following ceasefire negotiations that ended almost two decades of war. Not everyone believes women leaders are remarkably different from their male counterparts. Countries in Africa where women are leaders have not always been beacons of good governance, some observers say. But the reasons for this are deep-rooted and beyond the leadership capabilities of such female leaders. 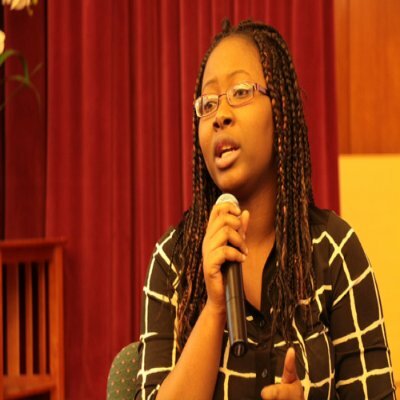 Satang Nabanech (Photo), a women’s rights advocate and attorney from The Gambia, lists several social, cultural and economic barriers that inhibit women’s ability to make significant changes in politics. Ms. Nabanech cites patriarchal politics, or a belief that men must naturally make decisions and that the place for a woman is the home. Violence in African politics may also discourage participation. Generally, women feel “a sense of vulnerability to political intimidation and violence,” notes the Afrobarometer survey. In Guinea, for instance, 64% of women say they are very concerned about political intimidation. Worldwide, efforts to enhance women’s political participation have shown progress in the past two decades. At the UN Beijing conference on women in 1995, delegates called on governments to have women represent 30% of their governments. To achieve the Beijing target, some African governments have used different types of quotas to increase women’s participation in government. For example, Burkina Faso and Uganda have constitutional provisions reserving a certain number of parliamentary seats for women, Kenya has special seats for women representatives in parliament, while political parties in South Africa and Mozambique have adopted internal rules to ensure a certain percentage of women can vie for office. 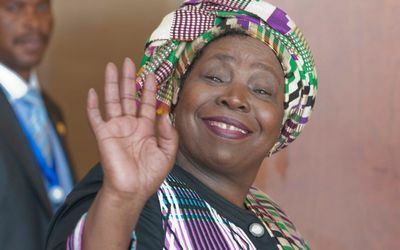 Nkosazana Dlamini-Zuma (Photo), chairperson of the African Union, says that although the gap between men and women on political participation remains wide, “in 46 countries across the world, women account for more than a quarter of all members of parliament. I am also proud to say that 14 of these countries are in Africa”. I strongly believe that responsible and well seasoned women, as compared to their male counterparts, are equally capable of holding high offices in governance and might even do better in some areas of responsibility. One of these areas is the social welfare delivery in the system. It has always been proved how women cared for the family and vulnerable people in society, such as the sick and elderly. Management of the home woefully rests on women, especially in Africa. Indeed they manage the home efficiently. As a matter of fact, most men can hardly live comfortably without a woman in the home. Are there any reasons to question their leadership ability? Africa is moving towards the right direction. Without the participation of women in governance, Africa will hardly ever make progress! !